Espresso is not easy – it’s part craft and part art. But with the right approach, you should be able to make a decent one at home. Espresso is not like making regular coffee… it’s messy and complicated. In fact, you’d probably do yourself a favor by leaving it to the pros. The thing is that espresso is a rather tricky craft to master. It requires attention to detail as well a serious investment of time and money. The observant reader might have noticed that I use the rather modest word ‘decent’ in the subheading instead of the usual hyperbole that’s a part of online articles. There’s a good reason for that: Making a proper shot means trial and error, and success is not guaranteed. You need some relatively freshly roasted coffee beans. Dark or medium roast? It’s really up to you. Same goes for whether you should choose a blend or single origin. When it comes to the beans, it’s an area, where you should experiment. Some people love an Italian espresso blend with robusta mixed in, while others adore the fruitiness of a medium roast natural processed arabica. Ideally, your coffee beans are not too fresh and not too old. Between 4 and 21 days after roast usually works great. Pro-tip: Because espresso is such a strong beverage compared to other types of coffee, you should choose a coffee that is less acidic than you would normally. That could mean coffee grown at a lower altitude than normally, or a slightly darker roast profile. 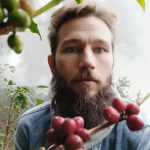 A few avant-garde coffee snobs enjoy light-roast shots that are almost lemon-juice like but I’m not one of them… and I bet the same applies to you. When it comes to water and regular coffee a lot can be said. However, many of these principles don’t apply to espresso the same way. With espresso, you also have the longevity of your machine to consider. For that reason, you should always use soft, odor-free water. Bottled or filtered water will be your best bet. Avoid (tap) water with much calcium as it will cause scale to build up. You also need some well-built equipment if you want to pull a proper shot. First of all, you need a quality espresso grinder. This is non-negotiable. Secondly, you need a good home espresso machine – preferably one with a non-pressurized portafilter. You can read a lot more about espresso machines here. That being said, nowadays there are few ways to make good espresso at home without a machine. Click this jump link to see how. Turn on the machine: Your machine should have at least 10 minutes to reach proper brewing temperature. Longer time if you have a heavy, old-school one. Measure the coffee: Use a scale and measure your dose. If, you’re making a double shot 18 grams is usually a good dose. However, this also depends on the size of your portafilter. You can skip this step if your grinder is dosing by time. Grind: Find the right adjustment on your grinder. Continually monitor this step, every time you change coffee bean, or if you encounter, significant changes in temperature. 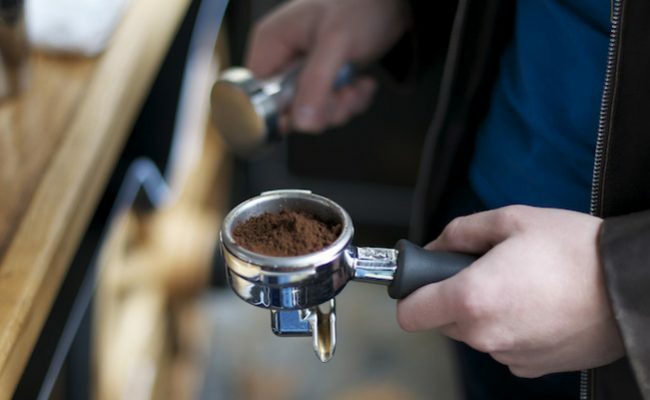 Dose and distribute grounds: Fill your portafilter with fluffy coffee grounds. Tap the bottom of the filter lightly a couple of the time to help the grounds settle and to avoid air pockets. Be careful about this step – it makes tamping a lot easier. 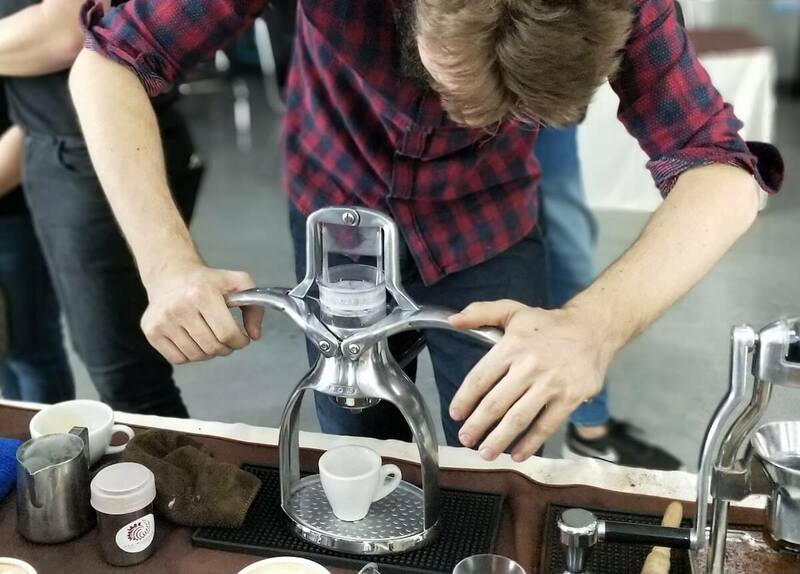 Tamp: Hold the tamper the same way you’d hold a bit like you’d hold a tennis racket, but let your thumb point forward. Twist your arm, so your elbow is directly above the portafilter. Press down firmly, but don’t use disproportionate force. If you’ve got the perfect grind size and did a good job tapping the portafilter in the earlier step, tamping should be smooth. Just tamp one single time to get all air pockets out of the puck. Finish off the tamp by polishing the top. Spin the tamper between your thumb and index finger gently. This will create an even surface. Clean and rinse: Check the portafilter for any unwanted grounds. Run water through the group head before brewing to clean it. Pull the shot: Insert the portafilter and start brewing. It’s a good idea to note down the brew time. Around 25-30 seconds should be the sweet spot. Notice the Crema: The thick golden layer on top of the espresso used to be seen as the hallmark of real espresso. However, today some coffee gurus claim that it actually doesn’t do anything and doesn’t taste good. If you ask me, however, crema is an essential component of a proper espresso. It not only looks beautiful, but it also tells you that you have done an excellent job extracting under the correct pressure. If you only see a thin or weak crema, it could be a sign that your coffee is too old, or that too little pressure has been generated while brewing. If that’s the case, you need to look at your grind setting, tamping or machine. You can get some non-electric manual contraptions that make great espresso with crema and a decent amount of pressure. These usually rely on levers that help force the water through your coffee puck. You can read more about these models in this post. Here I’m in the middle of testing the ROK. It’s good exercise. Can you make espresso with a French press? Sometimes new crazy ideas are invented by click-hungry sites. One of these ideas is that you can make espresso with a French press. It’s brewed under pressure. It doesn’t have to be precisely 9 bars like some people claim, but it should be in that range. A French press plunger doesn’t do anything at all when it comes to creating pressure. The only thing it does is to help separate water and grounds. Espresso should have crema and with a french press that’s not gonna be the case. Recently, a new device was launched called the Prismo by an innovative company named Fellow. 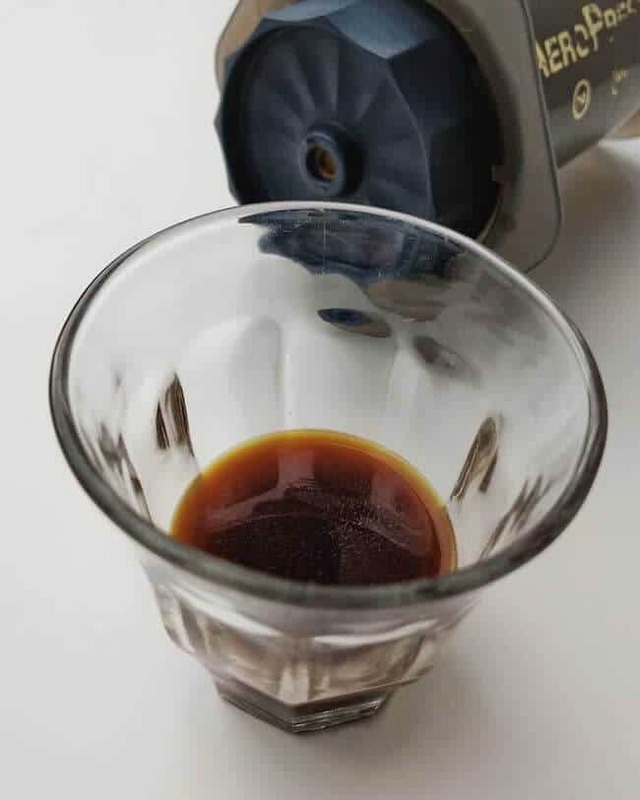 The Prismo is an accessory for the Aeropress that sort-of turns it into an espresso maker. Instead of a regular lid, you screw on the Prismo, which has a pressure actuated valve. I own the Prismo and generally like it, but I wouldn’t call it true espresso maker. First of all, even though some pressure is generated, it’s far from 9 bars. Maybe 1 or 2. However, the resulting coffee is exceptionally concentrated and makes an excellent substitution for espresso in stuff like cappuccinos, lattes or ice americanos. Lastly, we should touch upon the Moka pot, sometimes called the stovetop espresso maker. While this device relies on pressure and generally produces a powerful and concentrated cup of coffee, I still wouldn’t call it real espresso since it lacks crema and only brews at 1,5 bars. Similar to the Prismo, this coffee does work well with milk, so if you want to make espresso-based drinks and can’t afford a machine, this is a great alternative.